Greater Philadelphia Bicycle News: Are You Willing To Give Yourself To This People-Counting Program? Are You Willing To Give Yourself To This People-Counting Program? Much less overwrought than a Ludlum plot synopsis, the parklet is a parking space turned into a tiny roof deck stationed in front of coffee shops, libraries, and restaurants. Last year the City put up six of them to much acclaim. This year, MOTU is currently expecting to install at least eight, in Manayunk, Chinatown, West Philly, Fishtown, and Grad Hospital. to sit in a park for two hours and count people. 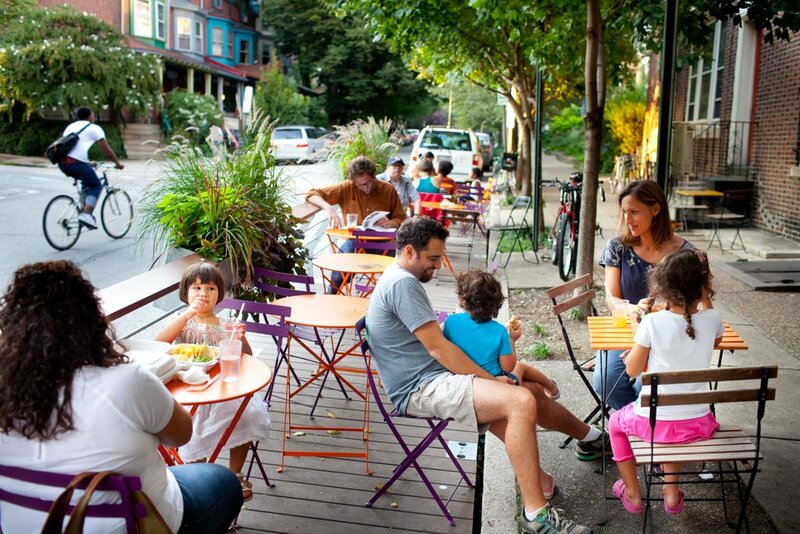 MOTU wants to study the parklets' impact on both businesses and pedestrians. Towards this end, they need volunteers to take 2-hour shifts hanging out in a parklet and counting users or passing pedestrians (there may be some before/after counts involved as well). Are you man or woman enough to serve your Mayor's Office of Transportation and Utilities? There is a kick-off sensory deprivation experiment informational meeting, but you don't need to attend the meeting in order to volunteer. If you are interested but cannot attend the meeting, contact coordinating Director of International Intrigue dude Ariel at ariel.ben-amos@phila.gov.